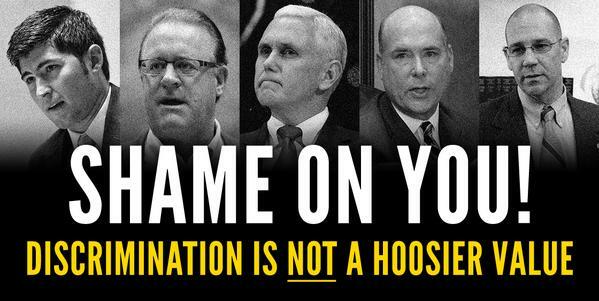 Shame on @GovPenceIN and the state of Indiana for passing the disgusting, discriminatory, and clearly Unconstitutional #SB101. Honestly, I didn't have any hope/faith that @GovPenceIN might actually veto #SB101, but I secretly hoped for a Grinch moment. 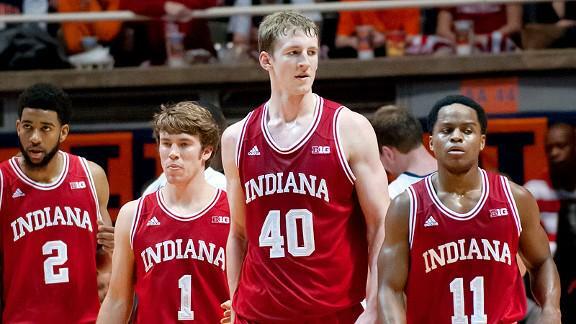 Indiana's #SB101 is @CoreyRobin 's definition of conservatism in action: the preservation of private power. 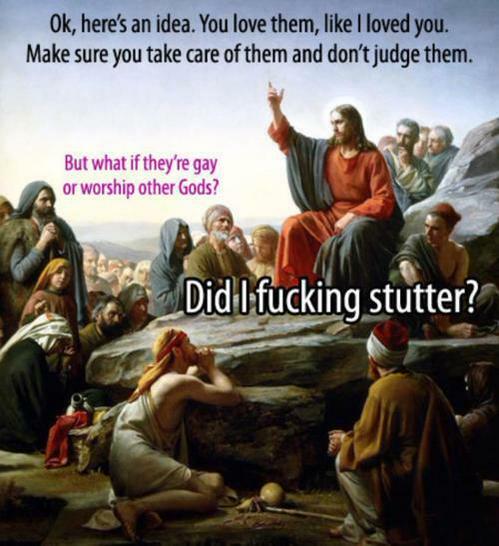 In #SB101's case, the power to discriminate against whomever, whenever, however. 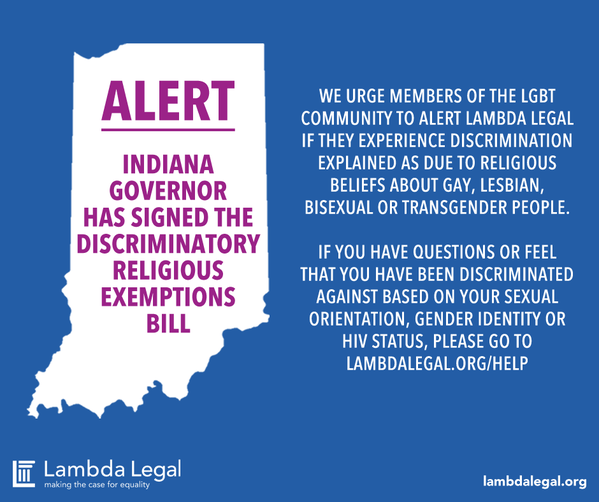 Tell @GovPenceIN no license to discriminate in #Indiana veto #SB101 http://pbs.twimg.com/media/CAu0_6pUgAAZ-i8.jpg ctt.ec/HbV00+ I'm from Indy. Help pls! Make 'em post signs though, e.g. "this business reserves the right to bigotry on religious grounds" or something. #SB101 Truth. I'm glad to see so many tweets engaging #NASPA16 and #SB101. Are similar convos about #ACPA16 and Montreal re: *trans taking place? 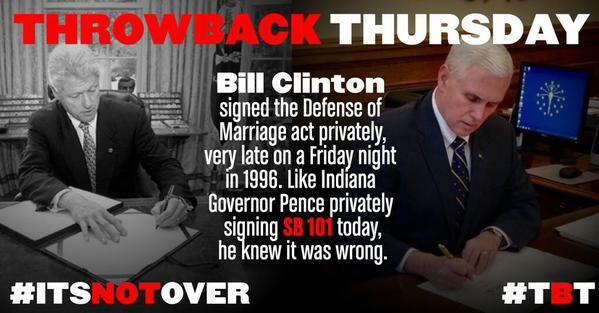 Indiana Governor signs anti-gay #SB101 in a "private ceremony." If you're going to take away people's rights, at least give them a show. "Huh? I've never heard of this 'Jim Crow' fella, but he sounds pretty gay, so he can't shop here." When gov's/POTUS's hold big signing ceremonies for bills they're proud of, Gov. 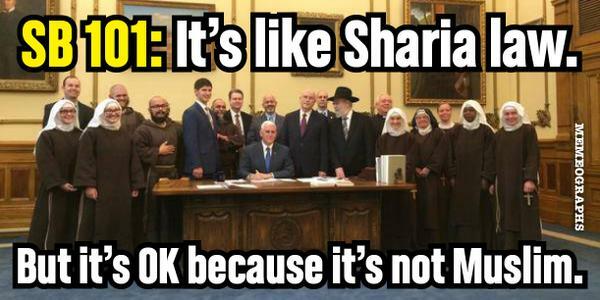 Pence signing #SB101 privately in his office speaks volumes.